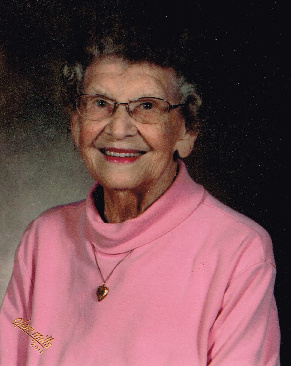 Edna Mae Wolfe, 93, of Lyons, passed away September 6, 2018 at Good Samaritan Society of Lyons. She was born February 3, 1925 in Geneseo, KS, the daughter of Jess and Frances Jung Hawkins. She graduated from Chase High School with the class of 1942. Edna was a lifelong Rice County resident. She was a homemaker and farmer. Edna was a member of First Baptist Church, Lyons, Eastern Star, 4-H leader, and active in the Women’s National Bowling Association. On June 2, 1942, Edna was united in marriage with Kale L. Wolfe in Lyons, KS. He preceded her in death on October 21, 1996. She is also preceded in death by her parents; brothers, Herb and John Hawkins; and sister, Thelma Warner. She is survived by her two sons, Duane Wolfe and wife Sandra of Lyons, KS, and Dale Wolfe and wife Claudia of Canton, OH; seven grandchildren and 18 great-grandchildren. Funeral service will be 1:30 P.M., Thursday, September 13, 2018 at First Baptist Church, Lyons with Pastor Joel Grizzle officiating. Burial will be at Lyons Municipal Cemetery. Visitation will be from 2:00 to 7:00 P.M., Wednesday, September 12, 2018 at Birzer Funeral Home, Lyons with family present from 5:00 to 7:00 P.M. Memorials can be made to Dementia Society of America in care of Birzer Funeral Home, Lyons.